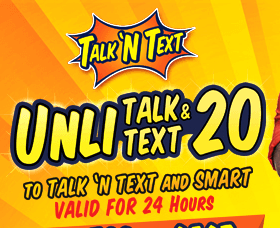 Talk n Text has unveiled a new promo the "Unli Talk & Text 20" also known as the T20 promo. This promo has unlimited call and text to any TNT/SMART subscribers which is valid for 24 hours for P20 pesos only. Most TNT subscribers complain about the time gap of unli call of Talk N Text, but this time T20 can be used to any time of the day until expired. Enjoy unli call and text to TNT and SMART. To call: Kindly refer to the confirmation message, since call prefix code might vary per area. Available only to Talk N Text subscribers. Register na mga KaTropa. Dahil ang Talk N Text ay hindi magsasawa na mag bigay ng affordable na promo.